Worker skills and job requirements: Is there a mismatch? Which groups and what skills or other labor force characteristics are at issue? What is the nature of skill trends? There is a widespread belief that U.S. workers’ education and skills are not adequate for the demands of jobs in the modern economy. Journalistic reports, employer surveys, popular and policy debates on school quality and education reform, sociological writings on the economy and the underclass, and economic research on the recent growth of wage inequality all suggest a mismatch between the skills workers possess and the skills jobs require, or what economists call an imbalance between supply and demand in the market for human capital. Many believe the imbalance will become even more serious because the pace of change in the labor market is accelerating and because the workplace is increasingly becoming a high-tech, service-oriented arena organized to involve greater employee participation in decision making (see Bresnahan et al. 2002 and also Smith 1997). At an April 11, 2000 “National Skills Summit” sponsored by the Department of Labor, Federal Reserve Board Chairman Alan Greenspan remarked, “I see nothing to suggest that the trends toward…increased demand for conceptual skills in our workforce will end….Workers in many occupations are being asked to strengthen their cognitive skills.” Such sentiments reflect those held by analysts who are concerned that a skills shortfall will harm the fortunes of those left behind, increase wage inequality, and limit economic growth. Although many aspects of the skills mismatch issue seem self-evident to casual, and even some informed observers, a closer examination of its complexities reveals considerable ambiguity, requiring better data than are currently available to gain a clearer understanding of the issues. In fact, the very existence of a skills mismatch or skills shortage may be in doubt and is by no means as obvious as often asserted. The somewhat limited and not completely consistent data currently available actually suggest that there is no evidence of declining skill levels in the U.S. workforce. Although growth in educational attainment decelerated in recent decades and cognitive test scores are not much higher than 30 years ago, skill demands have risen only gradually over time, with little direct evidence of any recent acceleration in skill demands linked to growth in wage inequality. Employers do complain about the skills of young workers and high-school-educated workers, but it is unclear whether they are dissatisfied mainly with workers’ cognitive skills or rather with their effort and attitude. Also unclear is whether the decline in workforce quality is a transitory, life-cycle problem of young adults in general or a problem they will bear for all of their work lives, or whether it applies only to some fraction of disadvantaged minorities. Perhaps surprisingly, a lack of computer and other high-level skills are not oft-cited complaints, despite the frequent focus on computers as a principal source of skills change. Furthermore, the claims of accelerating demand for college graduates also do not seem to reflect employers’ expressed needs. This study aims to improve understanding of the issues involved in the skills mismatch debate. 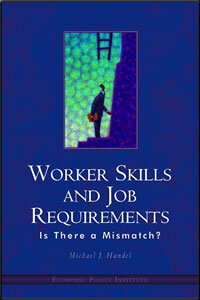 The first chapter provides some background and an overview of the skills mismatch issue. The following chapters review research on levels and trends in the skills workers possess, the skills employers demand, and the evidence for skill shortages or mismatches between the two. This tripartite structure is dictated by the nature of the data, which precludes a unified treatment of the question. There is limited reliable and representative data on workforce competencies, even less on job demands, and the evidence in each area is largely incommensurable. The need for a standard, common set of measures for worker skills and job skill requirements is the one key finding that emerges from this review of the existing data. Michael J. Handel is assistant professor of Sociology at the University of Wisconsin—Madison and a research associate at the Levy Economics Institute. He studies the growth of wage inequality in the United States and its relationship to technology, skills, and labor market institutions. He is currently conducting a national panel survey of wage and salary workers that address many of the issues raised in this study.